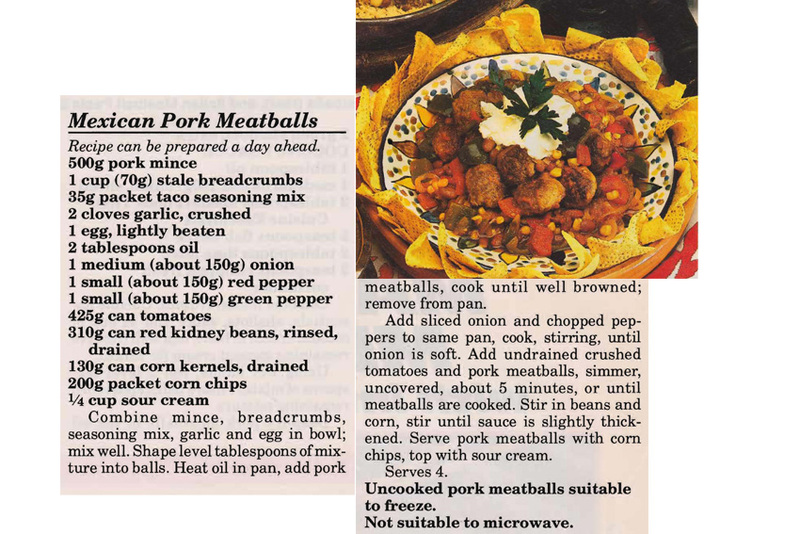 This recipe comes from a Women’s Weekly segment entitled ‘Make-ahead Meatballs’. As it says it can be made the day before you need it and that can be really useful if you have a lot of people to cater for. I also think the corn chips and sour cream make it a winner! This entry was posted in All Recipes, Main Dishes, Pork and tagged 1990s, corn, corn chips, kidney beans, meatballs, mexican pork meatballs, sour cream, taco seasoning by bebsrecipes. Bookmark the permalink.